Local longtime librarian, Sybil Tombe, is missing, abducted from her home on the outskirts of the isolated ranching town of Lost Trail, Montana. An elderly neighbor reports seeing a gray-haired, bearded man driving up to Sybil’s house the night she disappeared. Newly-minted Sheriff Zak Waller can’t think of a less likely target for a crime. When an older man is reported lurking around a young girl at the local grade school, Zak wonders if this man could also be Sybil’s abductor? The descriptions of the men are similar—but what could be the possible link between a young girl and 60-year-old Sybil? Peeling back the layers of Sybil’s life, Zak discovers Sybil is a master at keeping secrets, especially her own, and these secrets may now be threatening her life as well as the life of an innocent child. As Zak and his team work to uncover the truth, he also has to deal with issues in his romantic relationship with deputy Nadine Black, and mete justice to a respected town citizen who has been sheltering his criminal past for too long. 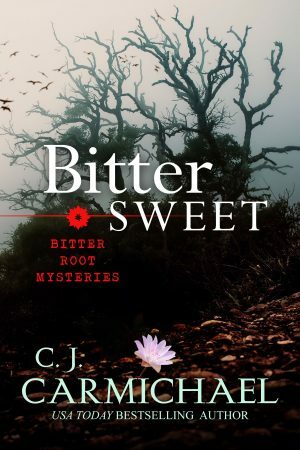 Order links for Bitter Sweet coming soon!